The wife of an academic jailed for life in the United Arab Emirates on a spying allegation said she has won assurances that the Government is "now standing up for one of its citizens" after meeting Jeremy Hunt. 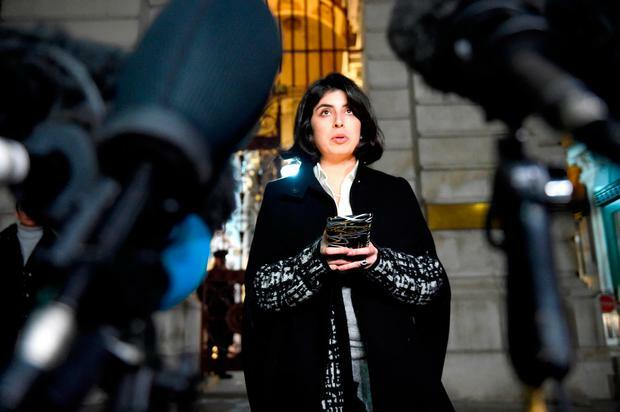 Daniela Tejada condemned the Foreign Office over the handling of the case of 31-year-old PhD student Matthew Hedges, ahead of her meeting with the Foreign Secretary on Thursday. Mr Hunt had threatened the UAE with "serious diplomatic consequences" if Mr Hedges, originally from Exeter, is not freed, saying he has seen "absolutely no evidence" to support the charge. However, Ms Tejada was critical of ministers, accusing them of putting relations with the Gulf state before her husband's freedom. However, she left the Foreign Office seeming more confident the Government was working in their favour. "I really appreciate the Foreign Secretary taking the time to meet me at this crucial point in Matt's life," she said, reading from a prepared statement after an hour inside the building. "He has assured me that he and his team are doing everything in their power to get Matt free and return him home to me. "This is not a fight I can win alone and I thank the Foreign Office and the British public for now standing up for one of their citizens." Mr Hunt is understood to have exchanged "very frank" words with the UAE ambassador in London during a meeting earlier in the day. Ms Tejada, having landed back at Heathrow Airport in the morning, said the UK had "failed" to take a firm stance over the Durham University student from the start of his ordeal. "I was under the impression they were putting their interests with the UAE above a British citizen's rightful freedom and his welfare," she told BBC Radio 4's Today programme. "They were stepping on eggshells instead of taking a firm stance." Health Secretary Matt Hancock defended the Foreign Office on the show for working "behind the scenes" to support Mr Hedges, with Mr Hunt appealing personally to the Crown Prince on November 12. Ms Tejeda, who was at the Abu Dhabi court when Mr Hedges was sentenced during a five-minute hearing on Wednesday, believes the UK should stop at nothing to free the "innocent" Briton, who was jailed after the UAE presented "completely fabricated" evidence. Her calls for immediate action were echoed by Tory MP Johnny Mercer, who condemned the academic's jailing and called for the Government to be resilient. He tweeted: "This is ridiculous. Our Defence assistance, mentoring and intelligence relationships alone with this country should preclude absurd things like this happening. From a friend and partner, simply unacceptable." Mr Hunt earlier said the UK "will do everything we can to get him home" over the charges he has seen "absolutely no evidence for". He told Sky News: "The UAE is supposed to be a friend and ally of Britain's. We've given them repeated assurances about Matthew. "If we can't resolve this there are going to be serious diplomatic consequences, because this is totally unacceptable. Mr Hedges, a Middle Eastern studies specialist, was arrested at Dubai Airport on May 5. A family representative said he had since been held in solitary confinement for more than five-and-a- half months, during which his "mental and physical health seriously deteriorated". Theresa May said she was "deeply disappointed and concerned" by Mr Hedges's jailing and told MPs the UK "will continue to press this matter at the highest level with the Emiratis". A Foreign Office spokesman did not say what form any possible diplomatic consequences could take, but said a number of options are available. Mr Hedges has 30 days to challenge the court ruling.